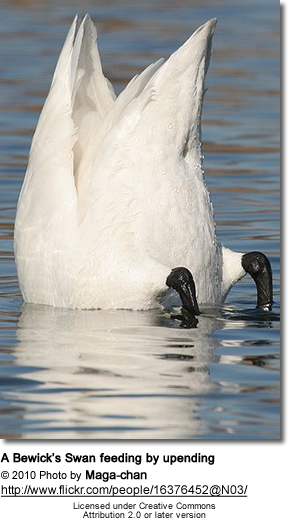 The Bewick's Swan is sometimes considered as the Eurasian race (subspecies) of the Tundra Swan with the scientific name of Cygnus columbianus bewickii. 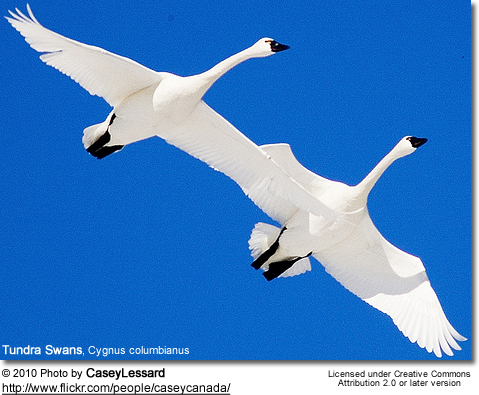 Some authorities split it up as a separate species referring to it as Cygnus bewickii. The Bewick's Swan is named after Thomas Bewick, who specialized in illustrations of birds and animals. He was considered to be one of the best English practitioners of wood engraving; his most famous book being The History of British Birds (1797). The Bewick's Swan is found in the Kola Peninsula east throughout arctic northern Siberia. They winter in Western Europe, south of Caspian Sea and east China, Korea and Japan. 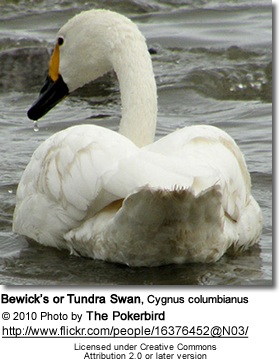 The Bewick's Swan is smaller in size than the Tundra / Whistling Swan. Otherwise look identical except for the large yellow patches on the Bewick's Swan's upper bill. Albanian: Mjelma e vogël ... Armenian: ???? ????? ... Czech: labu malá, Labut malá, Labu? malá ... Chinese: ?? ?, ??? ... Danish: Pibesvane, Tundrasvane ... Dutch: Fluitzwaan, Kleine Zwaan ... German: Pfeifschwan, Zwergschwan ... Greek: ?????????? ... Finnish: Pikkujoutsen ... French: Cygne américain, Cygne de Bewick, Cygne siffleur, Cygne siffleur ou Cygne de Bewick ... Irish: Eala Bewick ... Hungarian: Kis hattyú ... Icelandic: Dvergsvanur ... Italian: Cigno minore ... Japanese: amerikakohakuchou, kohakuchou, Ko-hakuchou ... Korean: ?? ... Norwegian: Dvergsvane ... Polish: labedz czarnodzioby, ?ab?d? czarnodzioby, ?ab?d? czarnodzioby (?ab?d? ma?y) ... Portuguese: cisne pequeno, Cisne-pequeno ... Romansh: cign pitschen ... Russian: ???????????? ????? ?, ?????? ??????????? ?, ????? ?????? ... Slovenian: mali labod ... Spanish: Cisne Chico, Cisne de Tundra, Cisne Silbador, Cisne silbón, Cisne Silvador ... Serbian: ???? ????? ... Swedish: Mindre sångsvan, Tundrasvan ... Turkish: Küçük Ku?u, Küçük Ku?u, Tundra Ku?usu ... Ukrainian: ????????????? ?????? The Bewick's Swan is the smallest of the swans that occur in the northern continents of the world. They weigh between 7.5 – 21 lbs (3.4 – 9.6 kg), with an average weight of 16 lbs (7.3 kg) for males and 14 lbs (6.4 kg) for females. They measure 45–59 in (115–150 cm) in length; have a wingspan of 67–77 in (170–195 cm); and a tarsus measuring about 3.7–4.5 in (9.4–11 cm) in length. The bill is about 3.6–4.2 in (9.1–11 cm) long. The Bewick's Swan has a relatively short neck, which give it the appearance of a large white goose. The adult plumage is entirely white; however, those swans that inhabit waters rich in iron ions (such as bog lakes), the head and neck plumage may show a golden or rusty hue. The feet are generally black - although in the Bewick's Swan specifically rarely yellowish feet have been observed. The bill is mostly black, with a thin orangey streak running along the mouthline and – depending on the subspecies – more or less yellow on the upper half of the upper beak. The eyes are dark brown. Gender ID: Females are slightly smaller than the males, but are otherwise identical in appearance. Juveniles: The down of chicks is silvery grey above and white below. Immatures have a white plumage mixed with some dull grey mostly on the head and upper neck, which often are entirely light grey. The first summer plumage is mostly white and during the second winter, they attain the adult plumage. Their bills are black with a large flesh-colored patch on the upper half of the upper bill below the usually black nostrils. The feet are dark grey with a flesh-colored hue. The Eurasian Bewick's Swan breeds in Western Siberia. 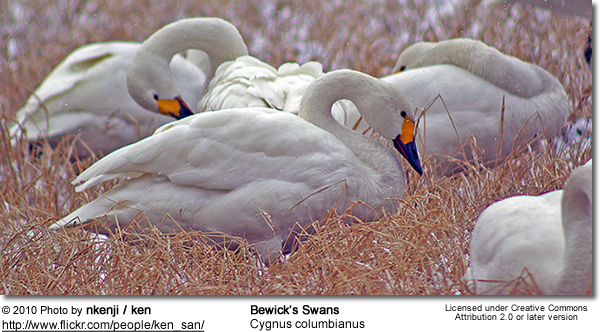 Breeding Habitat: Bewick's Swans breed on near lakes, ponds, shallow pools along coast, and wide slow-flowing rivers with emergent vegetation and pondweeds; as well as in open, moist, low-lying sedge-grass or moss-lichen Arctic tundra. They rarely nest in shrub tundra and avoid forested areas. The Bewick's Swans mostly winter in Western Europe. Winter Habitat: Often winter near the coast and in the vicinity of agricultural fields, which represent a major source of food during the winter months. Usually found in shallow tidal estuarine areas, grassland, brackish and freshwater marshes, shallow lakes, ponds, rivers and flooded pastures. The Bewick's Swans travel on specific routes with specific stop-over sites from their Arctic breeding ranges to the temperate wintering grounds. They usually fly in V formation at altitudes of about 8 km (nearly 27,000 ft) (Ref. National Geographic). Small groups of them arrive on their breeding grounds (usually between early March to late June); where breeding pairs will separate from the flock and disperse to their favored nesting sites. Some may nest in small groups in optimum habitats. After breeding, between late June and September, Bewick's Swans will undergo a molt which will leave them flightless for about a month. During this time, they will usually father in flocks on open waters as they would be vulnerable to predation on land. In mid-October, family groups will usually start their migration to their wintering grounds. They may remain at their usual stop-over sites (such as shallow ponds, lowland and mountain lakes, reservoirs, riverine marshes, shallow saline lagoons and sheltered coastal bays and estuaries) for as long as the weather conditions are favorable. Most arrive in their wintering range by November / December. During the breeding season, these swans sleep on land; but in the winter, they typically sleep on water. Outside the breeding season, Bewick's Swans are generally quite sociable and gather in large flocks of hundreds or even thousands. When breeding, however, they tend to be aggressive and territorial; and usually spread out to nest. Although some flocks may still occur consisting of non-breeding adults and birds that are too young to breed. They usually forage by day and roost at night on open water. Bewick's Swans make high-pitched honking calls that sound similar to those of the black goose (Branta). They are particularly noisy when foraging in flocks. They make loud excited calls when other swans arrive or leave. While in flight, the Bewick's Swan makes low and soft ringing bark bow-wow calls; while the Tundra Swan makes high-pitched bark-like sounds: wow-wow-wow. The Whooper and Trumpeter Swans make deep hooting and a higher-pitched French horn-like honk vocalizations, which serves as one method of identification. Bewick's Swans typically breed in freshwater marshes, ponds, lakes and along slow-flowing rivers with ample food supplies and few disturbances. They form monogamous pair bounds and remain with their mate until one of them dies; and even then the surviving mate may not mate again for years or may indeed never pair up again. The breeding season usually starts in the late spring upon their arrival at the nesting grounds. Upon arrival in the breeding territory, the pair will engage in courtship behavior, which includes bobbing their heads and facing each other with quivering wings. The nesting season is timed to take advantage of readily available food supplies. Bewick's Swans usually start nesting at the end of May. The female chooses the nesting area, while the male defends it. Swan pairs are most likely to return to the same nesting site if they were able to raise young successfully there in the past. Even they are not colonial breeders, Bewick's Swans may nest close together in optimum breeding habitats. Pairs will either build a new nest or repair the nest that they have used in previous years. The nest construction or restoration of an existing nest may take up to two weeks. The male uproots aquatic vegetation, grasses and sedges, and transfers it to the female, who will first pile it up high and then uses her body to form a depression to place her eggs in. The interior is lined with down and feathers. It is usually situated on elevated ground to reduce to the risk of flooding, . They defend a large territory around their nest. The female lays 2 - 7 creamy white eggs (usually 3-5), which are incubated for 29 - 30 days for the Bewick's Swan. Very rarely, the male may help brooding the eggs. In most cases, it is the female who broods the eggs, while the male remains nearby to defend the nest against intruders and predators. During the incubation period, the female leaves the nest only for short periods to feed on nearby vegetation, bathe and preen her feathers - however, before doing so, she usually covers the eggs with nesting material to conceal them. The male will also remain nearby to deter predators. If a perceived predator approaches the nest, either one of the parents will give a warning call to alert the other of the danger. They may lay a second clutch if the first eggs or cygnets are lost. The young hatch about 29 - 32 days later. The hatchlings' eyes are open and they are covered with down. They are able to leave the nest within 24 hours of hatching and have the ability to swim and feed. The juvenile Bewick's Swan fledge 40–45 days after hatching. The young remain with their parents for the first winter migration. The offspring of previous years may join them on the wintering grounds. Bewick's Swans reach reproductive maturity when they are about 3 - 4 years old; however, they will usually find their mates before the age of 2, mostly during the winter season. They start breeding when they are 3 - 7 years old. Just before the water begins to freeze, they will migrate south to the wintering areas. Family groups and mated pairs usually stick to themselves. The immature swans remain with their parents throughout the winter and migrate with them to their breeding territory in spring. The cygnets are about one year old then, and the parents drive them away as they are getting ready for nesting. The young swans remain together in sibling groups until they are about two years old, at which time, they themselves commence their search for mates. Some may return to their parents after the breeding season. Their family bonds are generally strong. Bewick's Swans primarily feed on the seeds, roots, and stems of aquatic plants, such as mannagrass (Glyceria), pondweeds (Potamogeton), marine eelgrass (Zostera) and Glyceria. sedges, reeds (Phragmites and Typha) as well as herbaceous tundra vegetation. They will also feed on the occasional small invertebrate, including mollusks and arthropods, and polycheate worms. They also eat some grass growing on dry land. Swans feed primarily on aquatic plants; but they also eat grain, grasses and crop foods, such as wheat, potatoes, sugar beets and carrots - especially in the winter when other food sources aren't readily available. Only young cygnets (immature swans) eat aquatic insects and crustaceans, as they have a higher requirement for protein than the adults. As they get older, their diet changes over to a plant diet, which includes aquatic vegetation and roots. They forage mainly by day both on land and in water. They are usually observed feeding in flocks. In shallow water, Swans may use their strong webbed feet to dig into submerged mud and, like mallards, they tip up - plunging the head and neck underwater - to expose and feed on roots, shoots and tubers. They feed in waters by uprooting plants and snapping off the leaves and stems of plants growing underwater. Swans also forage by swimming picking up plant material from the water's surface or water's edge. On land, they feed on grains and grasses. Cygnets feed on invertebrates and aquatic vegetation stirred up by their foraging parents. Ducks and other water birds also often follow swans to forage on exposed plant matter and aquatic insects. The oldest recorded Bewick's Swan was over 24 years old. However, average life expectancy of the Bewick's Swan living in the wild is about 10 years, as about 15% of adults die each year from various causes, such as hunting, lead poisoning and predation. 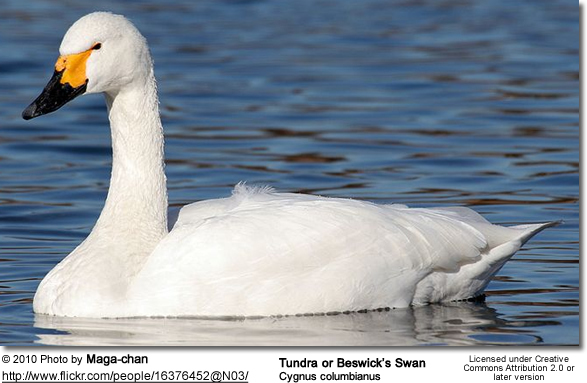 The Eurasian Bewick's Swan was estimated at 16,000-17,000 about 1990, with about 20,000 birds wintering in East Asia. The Iranian population consists of no more than 1,000 individuals dispersed to several sites. The Agreement on the Conservation of African-Eurasian Migratory Waterbirds (AEWA) applies to the Bewick's Swan. Hunting: The Bewick's Swans are generally protected, except for limited hunting seasons in certain areas. The main cause of adult mortality is hunting. Lead poisoning caused by the ingestion of lead shots also result in significant mortality. Habitat destruction and pollution lead to a reduction of aquatic vegetation in their winter habitats. Predation: Nesting females, their young and eggs are preyed upon by foxes, weasels, wolves, raccoons, bears, people and seabirds, such as jaegers and gulls. Nesting parents will usually leave their nest when large predators are in sight to not draw attention to their nest.